Home eXtreme botany Elementary my dear Dr M: Book of Stace #3 of 3 – Le denouement! Elementary my dear Dr M: Book of Stace #3 of 3 – Le denouement! So, here at last, in this taxonomic journey through the Book of Stace, after #1 and #2 we have arrived at our final destination, #3, tada!. This is #3 of 3, in TV terms this is the denouement, this is where Sherlock H or Hercule P gathers everyone together in the room and through a series of blistering, breathtaking, brain-boggling literary couplets, reveals the identity of the murderer to the astonishment (and audible gasps) of the crowd. Well plant ID is perhaps not quite so dramatic as Murder on the Orient Express, no murders to solve nor murderers to reveal, unless you really have taken against the Book of Stace. But a denouement there is to be sure, and a secondary denouement, following, as it does, the primary denouement revealed in #2 of 3 – the deadly family Solanaceae (aha! maybe Holmes and Poirot will be involved after all?). OK coming back down to the ground, focus Dr M, focus! In a way getting to the family is the tricky bit, now it’s the more straight-forward (if not actually easier) task of sifting through the closely related genera and species to reach a final answer. And what better tool for this taxonomic sifting than, you guessed it, the Book of Stace! 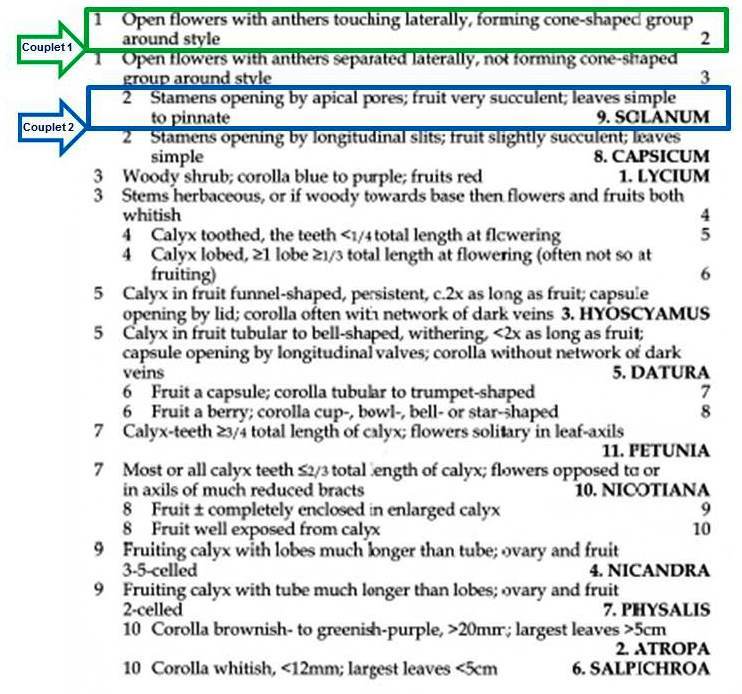 Now, let’s reopen said book and start with the key to genera of the Solanaceae (page 570). The anthers form a cone (couplet 1a) and they open by an apical pore (couplet 2a: visible on rhs in the image above). 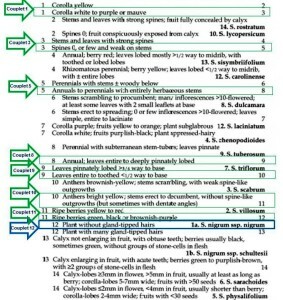 So genus Solanum is is! These are the Nightshades and the type genus of the Solanaceae. There’s a bit more to this bit. First is easy, corolla is white (couplet 1b), and there are no spines on stems and leaves (couplet 3b), it’s an annual with herbaceous stem (couplet 6b) and the leaves are entire to toothed (c.9b). Then we need to recheck the flowers and the anthers are bright yellow (and stems erect to decumbent) (c.10b) and the ripe berries are black (certainly not yellow to red). Finally, the plant does not have gland-tipped hairs anywhere and so we have Solanum nigrum ssp. nigrum the common English name being Black Nightshade. It’s been a while coming, but there you have it, one plant, one family, one genus and one (ssp. = sub) species! What’s a sub-species? Well it’s a group of plants differing in often minor morphological characters such as size or shape of parts, and either partially or completely isolated by means of geographic, ecologic or other barriers. So like a sub-group of a species. 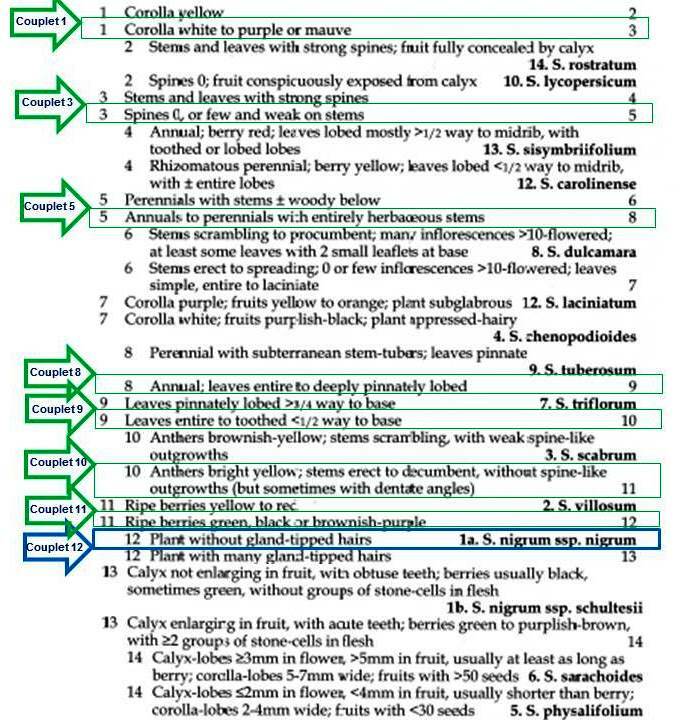 Stace gives the full description on page 576 of Solanum nigrum ssp. nigrum, and it’s always worth checking other books for illustrations. Finding it tough? Well take Dr M’s advice and tough it out! No-one ever said eXtreme botany was easy, but eXtreme botany is worth the slog, worth the confusion, worth even the blood, sweat, anger and tears of frustration! 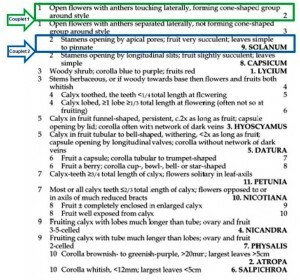 Honing and sharpening your plant ID skills in this way will pay back in dividends. There’s nothing quite like the satisfaction of successfully keying out a previously unknown plant (however eventually that result may be). It opens the doors to understanding; understanding what the plant is and why, and why it is so named (this one has dark berries – hence ‘nigrum‘), and how the plant is used or has been used in the past and its place in the grand botanical scheme of things! Finally, there can be only one way to end this short series of posts introducing the Book of Stace, and that is with the words of the man himself. Read the whole of both alternatives in the couplet before attempting to choose between them. If there is genuine doubt about which alternative, follow both and usually one will soon show itself to be wrong. If a nonsense answer is reached check back to ensure that you have not chosen the correct alternative but followed the wrong subsequent route. Before using a key to genera read the family description which contains useful information e.g. on interpreting terms and conventions.